You’ve shot your moose. Are you strong enough to pack it out? We ran as fast as the muskeg would allow, working against a deadline of the setting sun to get to the moose we had just taken before darkness closed in. Suddenly, the enormous animal was there before us, impossibly huge and hauntingly still. Standing there, a queasy feeling brought a knot to my stomach. My hunting partner looked over, the pained expression on his face evidence that he, too, had the knot. We'd both been around dead moose before. Our dads were hunters, and we would inevitably help butcher and pack meat when a moose was downed and thus had firsthand experience in field-dressing, quartering and packing. Facing it on our own was a very different reality and responsibility for a couple of 14-year-olds, as we were back then. Any first-time moose hunter who's never experienced the process should realize that bringing a downed moose from the field to the table is daunting. The enormity of the animals, which seems obvious while observing them in the field, suddenly becomes a cold reality when a big carcass is lying in a muskeg swamp. Experience with smaller big game helps, but it does not completely prepare one for dealing with the largest deer on the planet. Before you press the trigger on a moose, questions should be answered. Do you have experience in field-dressing big game? If you have experience with deer or caribou, field-dressing a moose is basically a larger version that requires considerably more effort. Explaining the entire process here would be far too lengthy, and even a detailed explanation would only offer a general idea. There are so many variables to contend with in the field that real-time experience is a must. There's also a wealth of information on the internet, including a good video on the Alaska Department of Fish and Game website. The basics are to get the animal skinned out without tainting meat (by puncturing intestines or stomach), cut it into packable pieces while keeping it clean and dry, and cool it quickly. A good skinning knife with a sharpening device or one of the new change-blade knives, a lightweight tarp in the 6-by-8-foot range, parachute cord, close-weave game bags, a bone saw and citric acid spray are the basic equipment requirements. If packing the meat out will take more than a day, you'll want to get it off the ground, where air can circulate around it, and you'll want to hang a tarp over it in case of rain. The longer it takes to get the meat out, the greater the possibility of a bear finding it. Pay attention when you return to the carcass and be prepared in case a bear has taken possession of your moose. As inviting as it will be to leave your rifle behind while you pack meat, it may not be in your best interest. But remember, killing a bear to defend your game meat is not legal; it's not considered a defense-of-life-and-property situation. How will you get the animal from where it's shot back to the vehicle that brought you to your hunting destination? Unless you are in an area where you can drive some sort of ATV right up to the animal, or you have horses or some other pack animal, you are going to have to put it on your back and haul it out. That being determined, you then must ask yourself, "Am I capable of tying a moose hindquarter onto a pack frame, lifting it to my shoulders and walking away with it?" 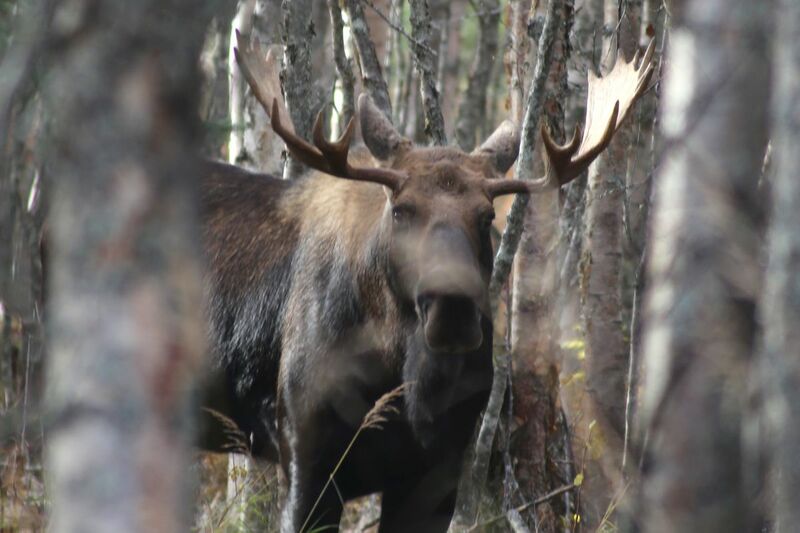 The hindquarters of a typical yearling bull moose will weigh around 100 pounds. A mature bull will have hindquarters weighing 150 pounds or more. Answering that question, if you haven't had the opportunity to help someone else pack a moose out, will have to come by loading a pack frame with an equivalent weight and trying it. Keep in mind, the terrain moose are normally taken in is muskeg, a soggy surface that can make walking as if through deep mud. Rarely is the terrain level and without deadfalls and brush to negotiate. Do your best to establish a realistic distance you will be capable of packing six to seven loads of this size in a reasonable amount of time. That may only be a quarter of a mile or it may be several miles, but it is your responsibility to get the meat out. 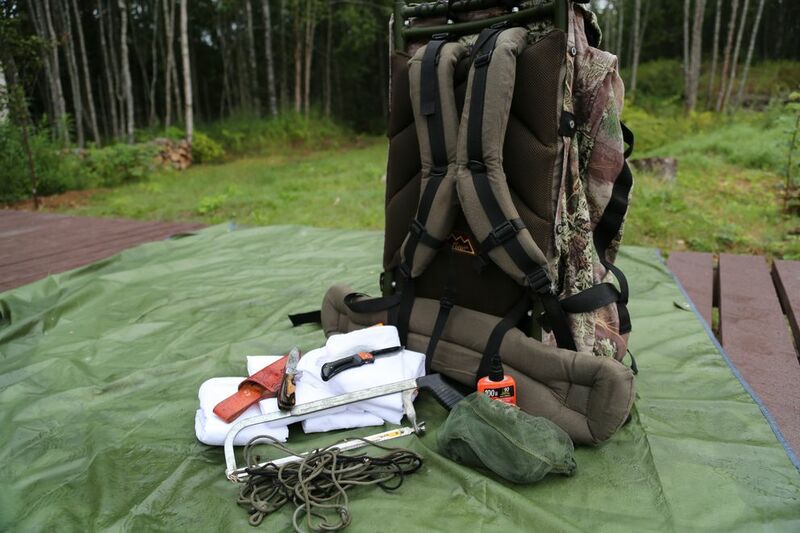 No one would recommend a first-time hunter, without packing experience, attempt this alone. Boning out the animal reduces the weight, but it comes with several downsides. Unless you are an expert, it is a long and difficult job. Boned-out meat in game bags does not cool well and can accelerate spoilage, and all the smaller pieces are inevitably more difficult to keep clean. For this reason there are some areas in Alaska where the meat on the hindquarters, front shoulders and backstrap must remain on the bone until it is removed from the field. Be sure to check regulations before you go. Don't let the excitement of a big set of antlers get you in trouble. In Alaska, antlers/horns cannot be brought out of the field before bringing in the meat. Select the right pack. 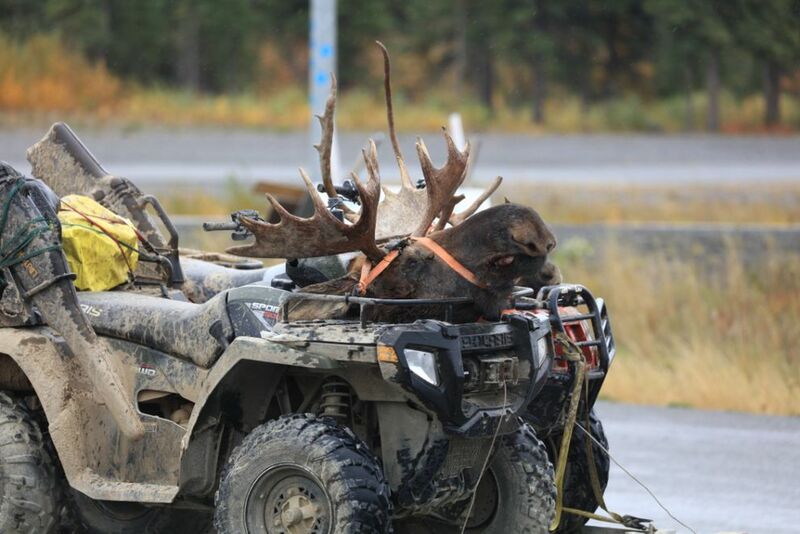 For hauling out moose parts on the bone, an external-frame pack with a large-capacity bag and a sturdy shelf on the bottom that supports the meat works well. The shelf-type pack frame also stands up on its own, making it easier to load the meat into the bag. Frames with a shelf, even without a bag, make it much easier to secure the quarters to the pack frame. If you are boning out the meat, a good-size bag on the pack is important. There are internal frame packs with huge capacities and that may also work well, although I've never used one for moose. The main thing is to try as many of these that fit the general description as you can. Ask other hunters you know if you can try what they use and load it up heavy when you do. The same goes for trying packs in the store. Get permission to put a substantial amount of weight (several 25-pound bags of shot work well) in them and walk around with them on. Try as many terrain features as you can, getting a good feel for how the pack fits you. The pack needs to be well-constructed, and there are numerous internet reviews of packs to help you decide. A decent pack will run from $200 to more than $600. Bringing home quality game meat is the point of hunting. It is a responsibility that rests solely on the shoulders of the hunter who takes the game. Be as realistic as you can in evaluating your abilities. Get out and help others field dress and pack if you can; the experience is valuable and rewarding. Take the time to do it right. The steaks you set down to eat later make the journey worthwhile.